The 2.5 MOA dot reticule improves range and accuracy. The lens cover tend to pop off easily. Bothersome blurring around the outer quarter of sight. Are you an archery enthusiast? 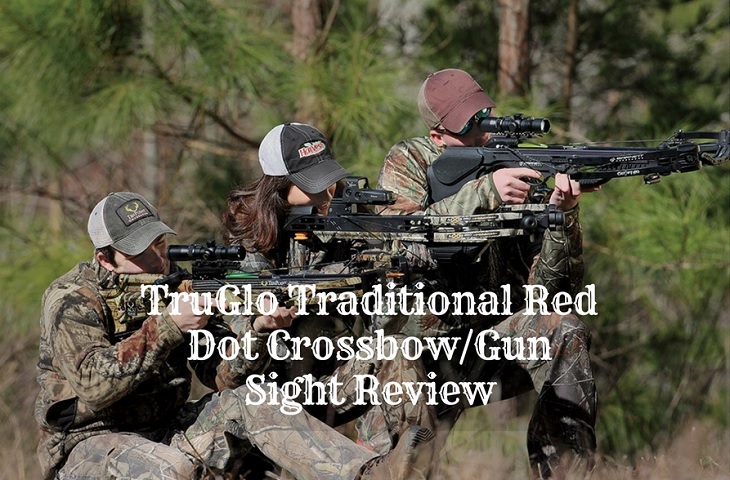 Please read this review of the TruGlo Traditional Red Dot Crossbow Sight. 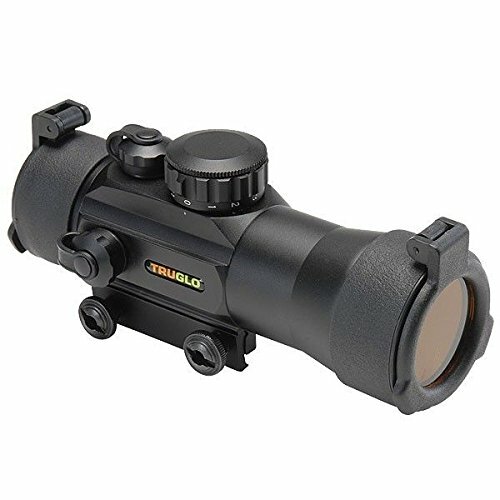 It is important to remember that this particular item’s model number is TRG8030B2 mainly because while most TruGlo are almost indistinguishable by appearance, only this one offers magnification. How well do the features stack up against the competition? Let’s find that out. How much magnification does the TruGlo Traditional Red Dot Crossbow Sight offer? 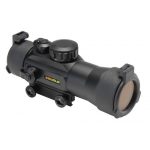 This red dot crossbow scope doubles up as a low powered scope that provides 2X magnification. However, while the picture resolution is lawless, the sight’s outer quarter does suffer from some blurriness. Luckily, this blurriness has no effect on the sight’s usability despite being a little disconcerting for first time users. It’s important to note that other magnified red dot crossbow sights do not have this flaw. What is the TruGlo Traditional Red Dot Crossbow Sight’s optics quality? This sight is fitted with 42mm objective lens and the entire optics setup is multi coated to maximize resistance to fog and water. I’ve used this sight in some of the coldest temperature in north Ohio without being inconvenienced by fogging on the sight. The sight uses a 2.5 MOA red dot which acquires targets quickly and easily. The dot is also smaller than normal and this results in a tremendous improvement in accuracy while shooting over longer ranges. This is because, it leaves most of the target image exposed unlike some other TruGlo dots (especially the 5 MOA ones) do. You need not worry about your eyes tiring while using this model and it offers a 27 foot linear field of view at 100 yards. You can illuminate the red dot using any of the 11 brightness settings, which means that the sight is versatile enough t be used in pretty much all lighting conditions. Moreover, since it boasts about 95 percent light transmission rate, your images will be clear, crisp and bright. The sight has see-through lens caps which you can flip open in situations where you do not need them. You have to be careful with these though; they tend to pop off completely when you flipped up. In case this becomes a big problem, simply use some electrical tape to wrap them 3 to 5 times. What is the TruGlo Traditional Red Dot Crossbow Sight’s quality of housing? Housing quality is a bit of a letdown as TruGlo manufactured it from cheap plastic and this really doesn’t have that durable feel that one would associate with a gun or crossbow sight. The sight is resistant up to 1kg, but this really isn’t much considering that a crossbow typically weighs around 2.8 kg. Dimension wise, it weighs 9.2 ounces and it’s around 5.3 inches long which means that it won’t bulk up your gun or crossbow. From my experience using this sight on a variety of shotguns, pistols and crossbows, I’ve found it to be always wonderfully balanced and hard to notice by other in my team. How easy is it to mount the sight? This sight mounts easily on weapons designed with Weaver style rails. You will have to use a fat coated screwdriver or an Allen key wrench to tighten the bolts. The bolts are a lot more convenient than the thumb screws the competition uses. Is it easy to sight in? Sighting in with this TruGlo gun and crossbow sight is always a breeze. It has windage and elevation Screw-down caps working beautifully to keep your elevation and windage set after you’ve sighted in. I had to use 6 arrows before sighting this on my crossbow but since then, I’ve never had to touch the elevation and windage adjustment knobs again. It is hard to use the TruGlo Traditional Red Dot Crossbow Sight? This is one of the easiest sights to use. You need not to learn any tips or tricks to get started; simply point to the target, line up the red dot, then shoot. It is a good improvement on the iron sights of yore and offer superior accuracy and aiming speed. Thanks for taking your time to read my assessment of the TruGlo Traditional Red Dot Crossbow Sight. It certainly is a great improvement over the iron sights I was used to, but t just doesn’t have that reassuring durable feel that would make me comfortable taking it along on those jarring trips. It is however, greater for casual use or range shooting. I wouldn’t rely on it serous hunting trips or paintball matches.